Architects are licensed professionals who design the buildings, structures, and spaces — both indoors and out — in which we live, recreate, learn, get well, shop, eat, and worship. In addition to designing how these buildings, structures, and spaces look, other factors the architect must take into consideration include safety, function, and budget. The involvement of the architect in the project varies from planning and designing the project to participating in the construction of the structure. Some architects focus on a certain niche, such as the design of schools or sports arenas, while others focus less on design and more on pre-design or construction management. The path to becoming a licensed architect is rigorous and takes many years. After receiving a degree in architecture, students must engage in a training or "internship" program — which vary by state but generally last at least three years — before taking the licensing exam. Most states require continuing education in order for an architect to maintain a license, and these requirements vary by state. Architects often work in office settings that allow them plenty of space to develop designs and drawings, write reports, meet with clients, and work with others in the building field. 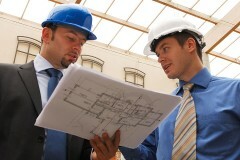 Depending upon specialty, some architects spend a large portion of their time working on construction sites. Architects typically work 40-hour workweeks, though working weekends and nights is not uncommon. Architects must be artistic, but they must also have a gift of combining form with function. They need to be good listeners in order to understand the wants and needs of their clients, but they also must excel at communicating their ideas. While competition remains fierce in prestigious architectural firms, there are still plenty of opportunities for those who choose to enter this field. Architects who differentiate themselves by specializing in a unique niche will further increase their chances of gaining employment. To learn more about architecture careers and career preparation, visit the American Institute of Architects and National Council of Architectural Registration Boards websites.